Controversy exists among trials assessing whether exercise can improve arterial function in type 2 diabetes mellitus (T2DM) subjects. Therefore the aim of this study was to systematically review and quantify the effects of exercise on arterial function in T2DM subjects. MEDLINE, Cochrane, Scopus and Web of Science were searched up until January 2013 for randomized controlled trials evaluating the effects of exercise interventions lasting 4 weeks or more on arterial function in T2DM subjects. Flow-mediated dilation (FMD) and nitrate-mediated dilation (NMD) of the brachial conduit artery were considered for assessment of arterial endothelial function and smooth muscle function, respectively. Five randomized trials comparing exercise and control groups (overall n = 217) met the inclusion criteria. The mean exercise characteristics were as follows: 3.6 sessions per week, 67.5 min per session, intensity at 74.4 % of the maximum heart rate (HRmax), for 14 weeks. The post-intervention mean difference in FMD favoured the exercise groups over the control groups (2.23 %; P < 0.0001). No significant post-intervention mean difference in NMD (1.22 %; P = 0.29) was found between the groups. Neither heterogeneity nor publication bias was detected among the trials. 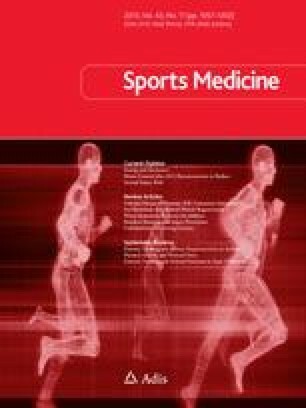 Exercise training alone improved FMD, showing its capacity to restore arterial endothelial function in T2DM subjects. However, further research is needed to determine whether longer and/or more intense exercise interventions could enhance arterial smooth muscle function in this population. The online version of this article (doi: 10.1007/s40279-013-0085-2) contains supplementary material, which is available to authorized users. The study was supported by grants from the French Society of Vascular Medicine in 2010–2012 (to A.V. and A.P.M.). The authors have no conflicts of interest that are directly relevant to the content of this article. Higgins JPT, Green S, editors. Cochrane handbook for systematic reviews of interventions: version 5.1.0 [updated March 2011]. The Cochrane Collaboration (2011). http://www.cochrane-handbook.org. Accessed 24 Jul 2013.